After impressing me with 2011’s Death & Legacy, Austrian symphonists Serenity are back again, and it must be said, impressing again. With much the same mixture of symphonic grandeur and infectious power metal songwriting, the band are something of a metallic opera, a musical that it’s ok to like. This is a slight improvement on excellence rather than a revelatory jump forward – the band still sound quite like Kamelot plus Sonata Arctica, but they have marked out their own territory, not least by bringing former live female vocalist Clementine Delauney on board as a foil to Georg Neuhauser, and the interplay of the duo is just perfect. Opening track Wings of Madness sets the stage perfectly, introducing both and giving each their moment in the spotlight without at all diminishing the impact of the excellent backing, both symphonic and metal elements tastefully and skilfully deployed to maximum effect. The metal elements are mixed in so well that it would be easy to miss the expertise shown by Thomas Buchberger, the band’s guitarist, but Serenity as a whole are a finely-tuned, well-balanced machine. This doesn’t feel like a typical symphonic power metal album, but is something classier, more aristocratic – that earlier mention of a metallic opera is a wonderful way to describe it, combining the vocal drama with the musical heaviness excellently. 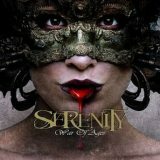 Serenity are at the peak of their songwriting powers, the instrumental flourishes of The Art of War leading into the guitar solo and then leading into the vocal hook flawlessly. There’s variety in the songs, in tone as well as tunes – the sombre, more restrained Shining Oasis with its Eastern hints builds up beautifully, whilst the following For Freedom’s Sake is a piano-driven ballad, something like a more nuanced, complex Iced Earth at first before Clementine’s section arrives and the metal section swoops in. It’s the six-minute Age of Glory that really grabbed me, though, with its speed metal riffage and symphonic bombast. The vocals simply ride an epic musical crest, surfing atop the music, and it’s just the sort of fist-pump-y anthem that symphonic metal should produce. As the longest track present at over six minutes, it’s not quite the epic-lengthed track that I asked for in my review of Death & Legacy, but does the work of a longer track and in its premium place at the middle of the tracklisting forms an especially bright star in a very bright sky. This is an album without filler, without dips in quality, and whilst there are odd moments that take steps away from the formula – such as The Matricide and Symphony for the Quiet having a bit more metallic heaviness to them – generally this is a uniformly excellent set of songs. Together, they form a remarkably good album that is a fine benchmark for power metal to beat over the rest of 2013.